To guarantee our rates the group has to consist of a minimum of 16 people. Everybody from the group has to have the same arrival and departure date and time. City tax not included in the price – 4% will be added. Bed sheets: In dormitories the beds need to be done on your own and you need to bring back the sheets at check-out. Every apartment has its own bathroom and kitchen. We have a bar in our house, which is opened from 4pm every day. Please note that in Budapest it’s allowed for everyone, at least 18 years old, to drink any kind of alcohol. If that’s prohibited for your group, please take care of that yourself. Payment: 80% of the total amount (for travel agencies 100%) at least until 4 weeks before arrival (specified date will be written in the booking confirmation). The rest is due upon arrival in cash. Please be aware that the transaction fee is not included. A key/security Bond of 5,000huf (or 20 euros) must be paid on check in by all members of your group. This is in case of any damages caused to the hostel or any issues with the group not following hostel rules. As long as no damages occur, the deposit will be returned to you upon checkout when you hand in your room keys. Any Damage caused by group to the hostel or any external partner’s property, during our stay, will be paid in full by the group. Any breaches of respect to other guests, staff or local residents will not be tolerated. In accordance with the laws of Hungary, we have a Zero Tolerance policy for drug use. Anyone found with drugs, under the influence of drugs or suspected of taking drugs on or off of the premises will be immediately evicted. We have a very strict NON-SMOKING policy in the hostel and on the whole hostel floor (also on the balcony) if fire alarm goes off due to group member smoking 100 EUR fine will be added to the bill. Unity Hostel @ Udvar(rom) is a hip, youthful, 'ruin-trendy' place boasting its very own ruin pub within the premises. 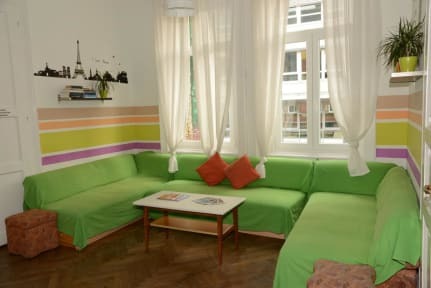 As we are one of the biggest hostels in Budapest, you will find it easy to meet great people from all over the world. Based on our guests’ valuable feed-back, we can proudly state that our staff is truly exceptional, so you can rest assured your stay will be phenomenal. May it be a traditional spa or a wicked pool party, the world’s most beautiful opera house or ruin pubs full of youngsters, fancy dinner cruise on the Danube or hop on hop off tour bus rides, we’ll point you in the right direction, set you up with tickets, and equip you with local wisdom. As regards our location, anything worth seeing is within walking distance. The best underground pubs, the coolest clubs in town, all major tourist attractions are only minutes away. St. Stephen's Cathedral 1 km, Europe's Largest Synagogue 0.5 km, House of Terror 0.9 km , Heros' Square 1.5 km , Buda Castle 4 km, Art Gallery 1.5 km , Széchenyi Bath 1.9 km to name but a few. In our clean and friendly environment we offer both private and dormitory rooms, in fact we even have a “girls only” dorm room to accommodate guests who feel more comfortable with such arrangement. All the rooms have their own bathroom and kitchen. Very beautiful hostel with a bar downstairs. This is not a good hostel if you want a lot of rest, because the music from the bar goes on till 2. The staff is very nice, everything is very clean. As long as you don't mind some noise and warmth, it's the perfect value for your money. Beds were ok, the bathroom was very dirty. Adres staat niet duidelijk aangegeven waardoor we aan de verkeerde kant van de stad stonden. Verder zit er een soort pub onder die doorgaat tot half 5 in de ochtend waar je veel overlast van ervaart.